There are many different types of power practice directed towards making soldiers obedient and disciplined inside the field of insurgency. While some commanders punish by inflicting physical pain, others use re-educative methods. While some prepare soldiers by using close-knit combat simulations, others send their subordinates immediately into battle. While these variations cannot fully be explained by the ideological set-up of different groups or by their political orientation, the basic assumption of the study is that they nevertheless do not emerge at random. This book puts forth that the type of power being utilised depends on the habitus of the respective commander and, as a result, becomes socially differentiated. Furthermore, power practices are shaped by the classificatory discourse of commanders (and their soldiers) on good soldierhood and leadership. The study found multiple ’habitus groups’ inside the field of insurgency, each with a distinctive classificatory discourse and a corresponding power type at work. While commanders shaped the dominating power practices (such as military trainings, indoctrination, systems of rewards and punishments, etc. ), low-ranking soldiers took active part in supporting or undermining power according to their own habitus formation. This book helps professionals in this area to understand better the types of power practice inside insurgencies. It is also a useful guide to students and academics interested in peace and conflict studies, sociology and Southeast Asia. 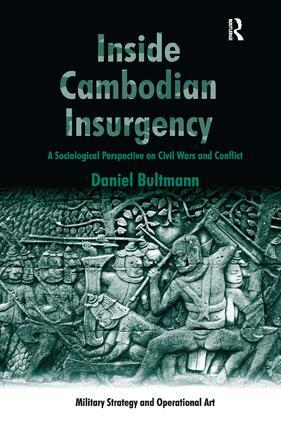 Daniel Bultmann is a sociologist at the Department of Asian and African Studies, Humboldt University of Berlin. His current research focuses on the sociology of armed groups and the military, peace and conflict studies, post-conflict societies as well as disarmament, demobilization and reintegration programs. He has worked on various aspects of the Cambodian genocide and the subsequent civil war.